I know I’ve been MIA lately. While everyone else gets excited about summer because things slow down, things always seem to pick up for me. I get super busy with the non-profit I’m involved with and we end up having something going on nearly every weekend. Plus, I’m only officially off in July, and I’m incapable of completely staying away. Today is July 12th, I only have a few weeks of my break left, and I’m determined to work on some of the items on my to-do list both for my TpT store and my forgotten-about-house. It’s about time I got around to these things before my time runs out. It just so happens that It’s About Time is also the name of my newest product! (Cheesy the way I did that, I know.) I reworked my polka dot clock clip art to give it a new color and I used it to create these cards. 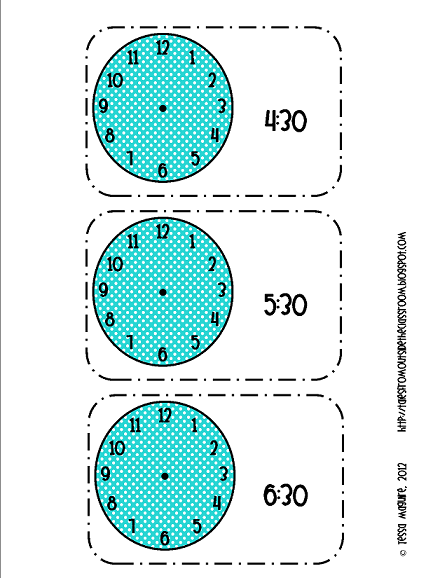 My original idea was to have the cards in a center, laminated, where students could write the time either on the clock or on the line. But after thinking about it, you can really use the cards for whatever you wish. They would be great as task cards or as cards for a write the room activity. I created two different versions. The time to the hour cards are FREEEE! You can download them here from my TpT store or here from my TN shop. I also created a file for time to the hour AND half hour. This meets CCSS 1.MD.3. You can get the file for $2 from my TpT store here or my TN shop as well. 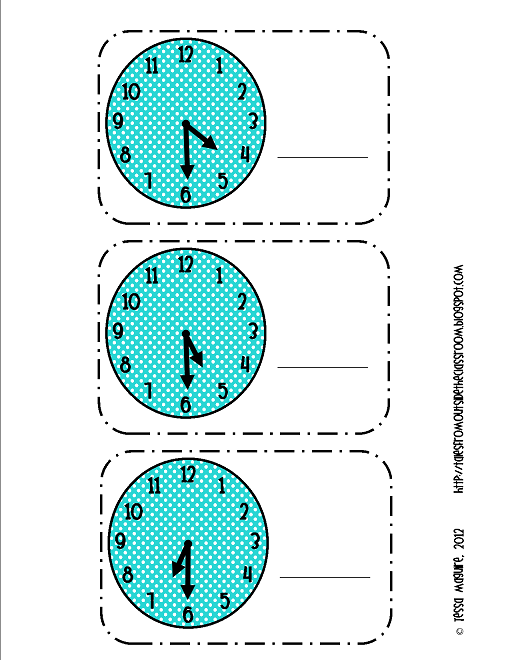 If you’re interested in creating your own activities you can get my Polka Dot Clock Clip Art from my TpT store. How have you been spending your summer break? Have you been blogging or blog stalking a lot? Or are you focusing your time on non-educational activities to give yourself a break? I have no little ones. I have no excuse!! Well, except for creating, blogging and being a TT is so much more fun! You're welcome and I'm glad you do! Thank you! These will be a great addition to my time unit. I'm your newest follower! I was thinking the same thing. I have a lot left to do and not much time to do it. Thanks for the clocks. Your time cards are adorable! How did you make the dashed box that is around that clocks? It's a border setting for the shape. That sounds easy enough. Thanks!